Our neighbor Elva stopped by just now on her way to the hospital to get a pacemaker, and she showed me this little angel that our mail carrier gave her. 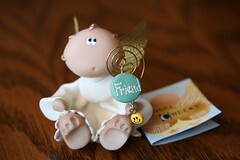 It came with a card that said, “A guardian angel to watch over you during your procedure today.” Isn’t that the sweetest thing? Elva wanted me to show it to Andy. Well, I’ll go a step further and show it to the world and ask everyone who sees this to say a prayer for our beautiful neighbor Elva today.